If you missed Part 1 of the "Naughty Natives" series, we highlighted trees. And here in Part 2, we're discussing shrubs. This "Naught Native" series aims to highlight the Wisconsin native plants that have a bad reputation as "weed plants" or that they are aggressive. Sometimes the aggressive nature, or undesirable traits, can be an asset rather than a nuisance in your landscape. And like certain trees, shrubs are often classified as weeds. I think this is an unfair distinction. With proper placement and maintenance, these potentially unruly shrubs can be tremendously beneficial to your landscape and wildlife. Do research before you plant. Have you ever encountered a dog that wouldn't stay put? Have you ever found yourself standing on the sidewalk stoically - trying to have patience while some over-eager mutt slobbers all over you? If you place this shrub in too small a space you may end up feeling somewhat similar. This is not a plant for a foundation planting or a small lot. 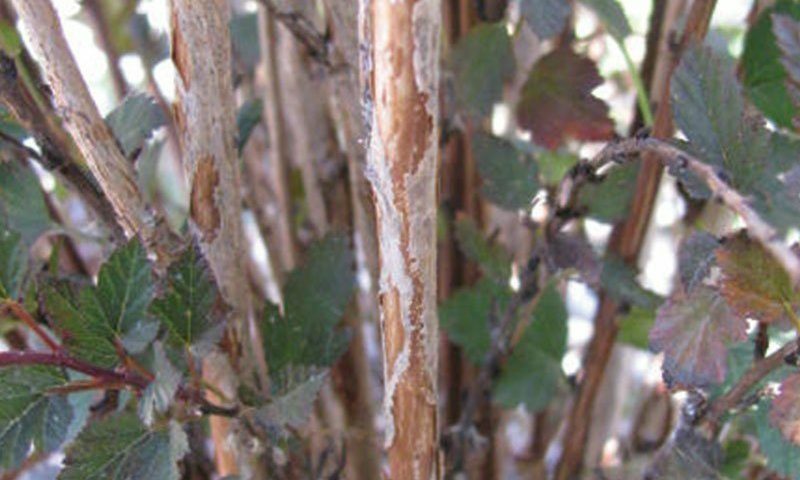 Stems can be 3' to 15' tall - but the spreading, suckering habitat can quickly spread if no adjacent plant competition exists. Sucker-tastic! Give this shrub an inch and it will take an acre. Placed correctly, in as much sun as it can get, and well away from other woodies, this can be quite a nice plant. It has many slightly attractive features that on their own may not be so awe-inspiring, but, when combined, add up to a fairly ornamental plant. It has shiny green leaves that appear mid-spring followed the end of May/beginning of June by small bunches of yellowish or creamy white flowers that attract many oddball pollinators such as hoverflies, tiny wasps, bees, and butterflies. These flowers eventually turn into little white berries with a black spot - much like a dozen doll's eyes perched atop a bright red bunch of stems, which stay on the plant even after the local birds and propagators pick the berries off. It can have a plum fall color that lasts through the end of the season. I think it ought to be used more in restoration projects where there is difficulty controlling woody invasive plants such as buckthorn and honeysuckle. Almost nothing can survive under the established dogwood patch. It provides food and a thicket-type habitat for native insects and birds. As far as dogs go - this one may not be for the neat and tidy home or anywhere near the sofa - but it makes one heck of a guard dog. Speaking of dogs - and of course I mean dogwoods - Johnson's Nursery has a selection of Gray Dogwood crossed with a relative, Silky Dogwood (Cornus ammomum), to form Irish Setter Dogwood. 'Irish Setter' has red stems that are very showy in the winter, disease resistant dark green foliage, and nice white bunches of flowers right in June. It sets minimal fruit - but when it does they are a blueish-white color. It does spread, but at a much slower rate than its parent species. This picture was taken on Good Hope Rd, just before you hit Lannon (by the quarries). Sumacs are a really interesting bunch of plants. Depending which ones we're talking about, they can be a vine, a low shrub, a tall shrub, a small tree, or a large grove of smaller trees. Members of this local plant syndicate include the infamous poison sumac, toxic poison ivy, and the more approachable members such as staghorn, smooth, shining and fragrant sumac. Let's start with my favorite. Staghorn Sumac - Rhus typhina - is a stellar plant for larger places. It can be tree-like, but it thinks it's a shrub...just a really big one. You'll find Staghorn Sumac along highways, in open areas where little else will grow, and along the woodland edge. On several occasions I've seen it trained as a single stem tree surrounded by lawn. It sends up suckers a couple times a year, but it's nothing regular mowing can't handle. Depending on the particular ecotype, I've seen them as a 4' tall spreading colony to a 20' tall single stem tree. Usually they land somewhere in between, in the 10-12 foot range as a spreading colony. Its flowers aren't much of anything, but the large tropical-looking pinnate leaves are unique among shrubs in our area. The true-beauty of this plant is the fall color - which is unrivaled amongst our flora except maybe by Sugar Maple, J.N. Strain Musclewood, and perhaps Chokeberry. Staghorn Sumacs are indifferent to soil conditions except that they don't like very wet sites. The coarse structure of Staghorn Sumac is interesting in winter; tall barren stems topped with dark red clusters of fuzzy berry-like seeds in a rough cone shape. They are not relished by birds, but it seems they serve as a desperate late winter fare, as they usually seem to get picked over a few months after the snow falls. A variation of all of the above descriptions is the Smooth Sumac - Rhus glabra - which is a lot like Staghorn, but grows with a hairless stem. Similarly, Shining Sumac - Rhus copallina - is generally a bit smaller in most regards. Its leaves have a widened rib in between the leaflets - which makes you wonder why the leaves decided to be pinnate in the first place. Fragrant Sumac - Rhus aromatica - is a bit different from its brethren. It's a finer textured plant, with smaller branches and smaller leaves that fit closer to the true shrub idea. This little brother is scrappy and can take a beating, able to withstand sandy areas, limestone ledges, rocky outcrops and Wal-Mart parking lots (most parking lots employ the ubiquitous dwarf cultivar "Gro-Low"). They are drought, salt, insect, deer, rabbit and generally death-resistant plants. Left to their own devices, Fragrant Sumacs can become quite large - I've seen specimens approaching 15' in height or more, but they love a good hedging and can be brought to a civilized scale with once a year maintenance. Common Ninebark has some pretty sophisticated cousins. Some are regally bedecked in rich burgundy, with bright flowering flourishes. Some come gilded with a golden hue denoting fine breeding. Others yet come in diminutive stature with all the fine textures of King Louis XIV's robe. I think one is even named after a queen....or in honor of one. 'Amber Jubilee'? Whatever. But as the rich and powerful stroll on by in their Proven Winners pots and their Monrovia air of superiority* (see disclosure below) - there is a plain black pot behind them, unadorned and unadvertised. It doesn't come branded and no royalties are paid, nor does it have a 6"x4" glossy colored stick tag....no fanfare. This is the Common Ninebark. It's got a lot of really nice attributes that can qualify it for some yards...but not all of them. Here at Johnson's - we propagate from plants native to the region - which I think makes them special. In early summer they flower fairly prolifically in white bunches, much like a spirea. These are followed by reddish seed heads that are a welcome addition to the late summer garden. 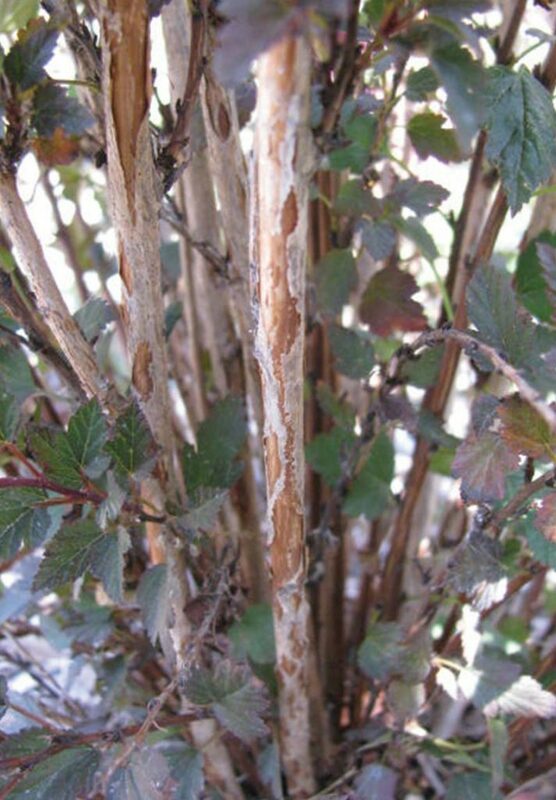 In winter there is a little interest in the bark on the older canes - long strips of exfoliating bark reveal a couple different reddish browns and tans. I've never counted how many colors, but this is what the plant is named for. Birds use these strips for building nests. So, it's no queen or king of the garden, just a poor shrub from a poor family...but Common Ninebark reminds me of a great buddy you've gone drinking with before. A buddy whose vigor for life, tenacity, and steadfast view on politics make him just as important (or more so) than any royal. The fruit is delicious. The flowers - nice. The leaves - interesting. But, lurking underneath the leaf litter, sliding through the loam, lies the rhizomes of a massing shade shrub. Thimbleberry is like the gray dogwood of the deep shade. This may be one of the most shade tolerant shrubs native to WI. I've seen it growing under the full shade of Hemlock and Sugar Maple. It seems to need humus rich soils that have abundant moisture content - so I think dry shade might be unsuitable, but I've never seen it tried. The fruiting capacity of Thimbleberry is not nearly on par with its relatives, blackberries and raspberries. The volume is rarely heavy - only putting out a few berries for every stem (and only the high ones), but the few produced are very tasty - being closest in flavor to a wild red raspberry. They are also incredibly tender. The flowers are cute, a clean white with a greenish-yellow center, but somewhat sparse and sporadic on the plant. They also flower briefly, so it's easy to miss the show. I like the texture of this plant. Its leaf structure is very different from other Rubus species- it looks like a ruffled maple leaf. If you have some "shady" neighbors you don't want to see, with a bit of sun, this shady shrub forms a dense canopy that is difficult to see through. In deeper shade it becomes more airy in leaf and taller in height. Note: In container culture, the tops die back in winter fairly regularly for me, but come back very strong from the base and out the drainage holes in the pot. My workers call it a "jailbreaker" plant.